Everyone is familiar with Alice's Adventures In Wonderland, whether they've encountered it by watching, listening or by reading. I admit this is actually the first time I've read the book itself, but I've seen the Disney cartoon and most recently the Tim Burton adaptation (which of course is very different as it features an older Alice). So going in, I had a good idea of what to expect. "When we were little," the Mock Turtle went on at last, more calmly, though still sobbing a little now and then, "we went to school in the sea. The master was an old Turtle -- we used to call him Tortoise ------"
I single that part out, but really there were so many moments that had me tickled. 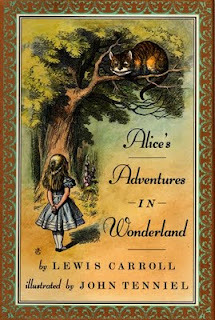 There can't be many book lovers who are yet to pick up Alice's Adventures, but if you haven't, do. It's so charming and offbeat that it will keep you light and happy on even the dreariest of days!